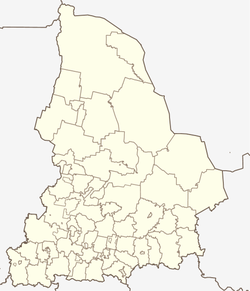 Pyshma (Russian: Пышма) is an urban locality (an urban-type settlement) in Pyshminsky District of Sverdlovsk Oblast, Russia. Population: 9,806 (2010 Census); 10,262 (2002 Census); 11,515 (1989 Census). This Sverdlovsk Oblast location article is a stub. You can help Wikipedia by expanding it. This page was last edited on 22 December 2018, at 10:58 (UTC).